Yeah, most NY pizza isn't so great; but Lombardi's would have been worth the walk! And, might have changed your mind. It's kind of like the oyster thing. Oysters are oysters, then you start craving brinier, bigger ones after you have them often. Same with NY Pizza: so many selections, then you start to whittle it down: favorite by-the-slice, favorite brick oven, favorite clam pie, etc. My problem with DC (having grown up here but lived in NYC for a few years) is that unlike NYC, there aren't pizza places on every corner. In DC you have to seek out places where you can get a slice. For instance, why in downtown are there only a handful of places. My fav advertisement I just noticed is at Washington Deli (20th and I), which has a neon sign saying "Try a slice of Long Island." Since when is Long Island known for its pizza. For me I'll stick with Vace and 2 Amys. Washington Deli has real NY pizza. By "Long Island" they mean NY style, which can be found pretty much everywhere between Philly and Boston. BTW, Brooklyn and Queens are technically parts of Long Island. I think part of the reason people are disappointed by NY style pizza is that they are expecting something different from NY style pizza. I guess they're expecting something more "gourmet" like real authentic pizza along the lines of pizza paradiso, or 2amy's but even better. This is not the case with NY style pizza. While some of it can be considered to be more "gourmet" (the places that use fresh mozzarella, instead of dried) most of it is much less fancy. Consider this analogy. If real gourmet pizza is like a fancy sandwich in a Paris bistro, NY Style pizza is like a Philly cheesesteak. No less good, but different. Personally, I'd usually go for a cheesesteak, and I'd usually go for a real slice of NY style over a Pizza Margharita in the true Neapolitan style, though admittedly I haven't really had a chance to sample a lot of the latter kind. 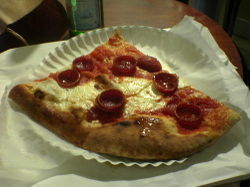 See these links ot Roadfood.com for good pictures of NY style pizza pies. Seemed like you just ate cheese or pepperoni. Real NYC pizza is about the toppings - fried eggplant and ricotta, broccoli rabe, etc. Best pizza is at the ORIGINAL Rays in Soho or a little stand up counter called "Little Italy" on 43rd and Madison. They must have a garden in the back cuz the toppings were that fresh. I generally prefer a simple plain pie over one with a lot of toppings. That's just my taste though. And Valentino's! Don't forget Valentino's on the pro-DC list. It's way down off 395, but that's right by my office and oh-so-perfect for lunch, mmm! I might have to go get some right now. I've never had a thing for NY-style pizza, but my husband (who grew up on Long Island) craves and loves it, and swears nothing else comes close. No hate mail. I've eaten so-so pizza in many places in the city. If you ever wander into the Bronx, I highly recommend Louie & Ernie's at 1300 Crosby. Also, www.sliceny.com has pointed me towards some great pizza places. If you are ever in the Great Falls area, make a point to stop by Romantica for a slice of their pizza. You will not be disappointed. Well... I am a former Brooklynite turned Washingtonian and I have to say that DC's pizza (by the slice) does not hold a candle to NYC, except for Vace or The Italian Store. That is what NYers are talking about- flat by the slice. When we first moved here, we were dismayed. We didn't find 2 Amy's til about a year ago and we thought that we were going to be stuck only eating Pizzeria Paradiso style pizza. Of course, PP and 2A are more expensive and I miss having a quick and cheap lunch in the form of pizza. You were right about midtown. There was a good place where I used to work at 58th and 8th ave, but most places aren't as good as Brooklyn. Funny I was in NY last week doing the food excursion as well. We stayed at the Grand Hyatt and I must say Midtown is pretty bleak. We went down to the East Village and ate at Paladar Friday night. Really good (and cheap) latin place owned by Aaron Sanchez. Best mojitos I have had (that I didn't make myself) and cool location. Think Cafe Atlantico style menu in a hip, neighborhood, Aroma Company type location. Grabbed sandwiches at Bryant Park Wichcraft on Saturday. Really decent pulled pork panini but the chilled cucumber soup was the standout. Saturday we went to Jovia thanks to Tom's postcard from NY. WOW. Service was alright but the food was great and they had a nice wine selection. They had a 3 taste flight of Long Island wines for 10 dollars that went great with the appetizers we ordered. I had a roast pork tenderloin with a creamy apple puree, what looked like some speck or prosciutto and spinach. Best pork loin I have ever tasted. The meat was perfectly cooked and seasoned. When you got a bite with a little of each sauce and meat on the plate it melded perfectly. That was definitely one of my top 5 meals. Anyways just thought I would drop a mini review if anyone is going up to our northern Big Brother anytime soon. Just out of curiousity are you Dcist Jason on the DCist blog? In April I went to Grimaldi's in Brooklyn at the recommendation of a friend. I thought it was awesome, although very different from the pizza that I love in DC. Since I know you like Indian food, have you ever tried Dawat when you were in New York? It's sort of a different style than what you get at Heritage or Amma, but I was just amazed by some of the delicious curries I've had there. oh you were so close to some really great pizza by the slice at 25th and park avenue south. everyone that works around there goes in and it is awesome....pizza park. you are right about the italian store. YUM! try the pepperoni bread. it is AMAZING. the best food on earth. they don't just sell it anymore, you have to call and request it. I also went to Grimaldi's in Brooklyn in April. The pizza was awesome, and I'm so glad we hopped a cab to eat there. As for pizza in DC, I like places like 2 Amy's and Vace, but I really consider those different styles of pizza (and 2 Amy's is definitely more expensive. We ate at Grimaldi's for less than $20). My husband is from Staten Island, and he only eats his slices plain. NY pizza to him is just cheese and tomato sauce. Try Al's on Capitol Hill. Nothing better than John's Pizzeria. There's one at 44th, one at 64th, and one on Bleeker... Can't buy by the slice though - not that you'd want to. It's THAT good. I finally got to 2Amys a few months ago after hearing about it for so long. After the very long wait we were seated in the slightly over-loud dining area.... and the pizza, while good, didn't live up to what we get at our favorite pizza source, Lost Dog Cafe. I'd highly recommend anyone who likes pizza to give them a try. Where is Lost Dog Cafe Don?